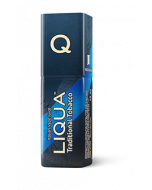 LIQUA Q Turkish Tobacco marries the typical flavour of Turkish tobacco with an intense oriental aroma and a honey-sweet finish. This entire range of Vape Juices is produced in our state-of-the-art facility in Italy according to the strictest EU standards and using the highest quality ingredients, including Swiss pharmaceutical nicotine. LIQUA Q Italian Vape Juices come in stylish rectangular packs with long narrow spouts for easy and convenient re-filling.